Exposure Info: Grayscale image; 1 second, binned 3x3, approximately 10 seconds apart due to download times. Video sequence information: Acquisition of 211 frames with CCDSoft. 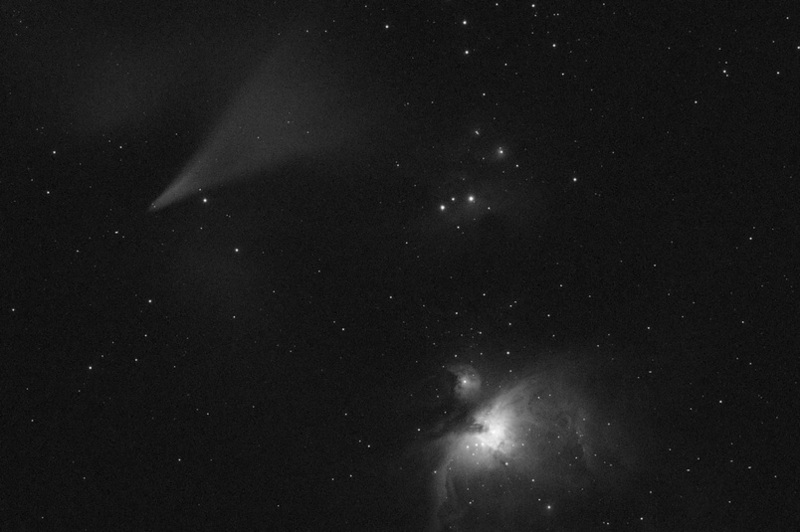 36 frames around M42 selected, then calibrated and DDP'ed in CCDstack. Noise removal of individual frames in Photoshop CS2 with Noel Carboni's Astronomy Tools actions. Conversion of individual frames to JPEG. Conversion of frames to AVI movie format using Photolapse software. Equipment: Takahashi FSQ-106 refractor, Takahashi NJP mount, SBIG STL-11000 astro CCD camera. There is an old saying, "Chance favors the prepared mind." Well, I do not know how prepared Vance Bagwell and I were to contemplate what we saw on one beautiful, November night, but at least our equipment was ready to capture it in pictures. Vance and I are veterans at astronomy outreach events, so when a couple of Fort Worth visitors to the Comanche Springs Astronomy Campus near Crowell, Texas, came to us at 2:40am on November 11th to ask why nobody told them about that comet up in Orion, we immediate rolled our eyes. After all, we've heard something like that a million times when visitors come to our dark skies for the first time. However, when I loaned my green laser pointer to Danny Townsend and Kevin Ulrich of Fort Worth to show us what it is that had them so excited, our eyes stopped rolling. Mouths agape at the naked eye object that was both larger and brighter than the Orion Nebula, which rested only a couple of fingers away, Vance and I immediately shifted into our "serious" astronomer persona and grabbed any optics available to catch a closer view. But when we detected movement of the mysterious object from west to east, heading on a collision course with the Orion Nebula, both Vance and I scrambled to halt our imaging sessions and acquire the event. Since my scope was already on the nearby M78, it was a quick jog, thankfully. Upon acquision of the object just west of the Orion nebula, I managed 211 one second focus frames while tracking on the slowly moving "comet." 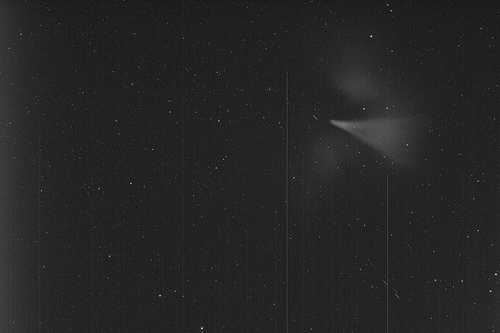 Of course, knowing that this wasn't likely to be a new comet due to its brightness and speed, our spectulation at the time was some kind of rocket shot or reentry vehicle. "Early Sunday morning a couple of transient naked-eye "nebulae" or "comets" are expected to be observable, weather permitting, from all of the western hemisphere at the end of the launch sequence of DSP 23. The launch window is 8:39 - 10:41 PM EST Saturday night (1:39 - 3:41 Sunday UTC) from Cape Canaveral, Florida. Spacecraft separation will occur just about 6.5 minutes after the end of the burn. Not long after spacecraft separation excess fuel and oxidizer will be vented from the Centaur. This will be the second nebula/comet -- the brighter one, I think (but am not sure). The burn itself (i.e., the flame) may be visible with a telescope. At least one of the nebulae/comets may be as bright as first magnitude. As these events will occur very near geostationary height, they will not move very much in the sky. The burn cloud may move at nearly sidereal rate. The venting cloud may be nearly stationary as the stars move by. But both of them may move to the north or south, as the nominal final orbital inclination is four, not zero. DSP satellites themselves are very faint unless specular reflections off their four solar panels are observed. They are spin-stabilized at 6 RPM. ".